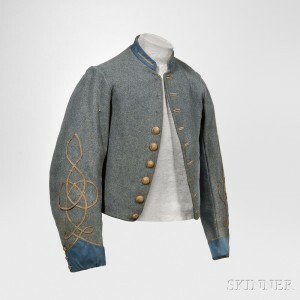 A Civil War collector’s prize: The Richmond Depot Type II Jacket | Skinner Inc.
One of the most interesting Civil War collectors I knew when I was young was the late Denis Reen. His antics are still talked about over campfires in the living history community, and I am proud to be offering his collection in Skinner’s upcoming, October 30th, Historic Arms & Militaria auction. One of his most prized possessions was the Richmond Depot Type II jacket he tracked down. Passed down through the family of the original owner for generations until he acquired it, it is the only known Stonewall Brigade jacket in private hands. It was worn by Lt. John J. Haines of Company E. 2nd Virginia Infantry Regiment and is an enlisted jacket made from English army cloth that Haines must have had converted to an “officer” by adding the blue pointed cuffs, blue collar, and the gold galloon on the sleeves. Although there is no evidence of it ever having had belt loops, he did cut the shoulder straps off. Haines enlisted in 1861 and was wounded during the battle of Fredericksburg in December of 1862. His service records state that he was “severely wounded by musket ball not serious,” an interesting statement in itself. In 1863, he was captured and spent the rest of the war in a Federal prison camp. I am honored to have this Richmond Depot Type II Jacket from 2nd Lieutenant John James Haines, 2nd Virginia Infantry (Lot 147, Estimate $30,000 – $40,000) on offer in our upcoming Historic Arms & Militaria auction 2856M at 4PM in Skinner’s Marlborough, MA Gallery. 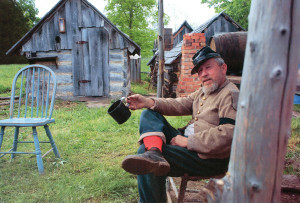 This entry was posted in Blog and tagged Civil War, civil war reenactment, civil war uniform, denis e. reems, historic arms, Militaria by Joel Bohy. Bookmark the permalink.